When Sarina Rose isn’t quilting blankets for local hospitals or wheelchair bags for nursing homes, she’s typing away at her computer, lost in a world of vintage romance. The GFWC Melbourne Woman’s Club (Florida) member is the author of three books in “The Relentless Series”. 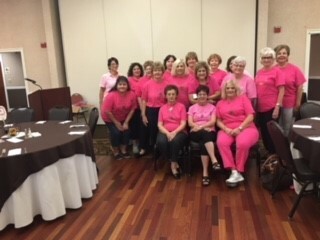 The GFWC Marlton Woman’s Club (New Jersey) has 41 members who are always trying to put a smile on the faces of others. President Lisa Levin said, “My goal has always been to work together as a club, making our members shine, and making a significant difference in the lives of others.” She also encourages leadership and engagement by motivating members to be a chairperson or to be part of a committee.